Happy Friday ya’ll I have always wanted to “say” that..because, tomorrow Joe and I will be heading to the Lone Star state for a few days! And I am soo so thrilled! I can not wait to get my bbq, 2-steppin and Tex-Mex on! We will be in Austin and making a day trip to the Houston area, so any suggestions or recommendations, please send them my way! 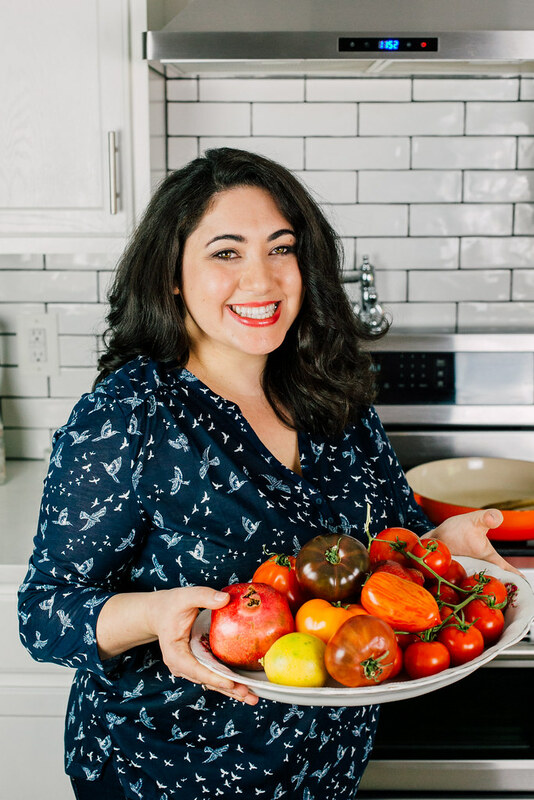 And of course, you can follow along on my Instagram for all the tasty eats…would it be appropriate to wear my “This Jew Loves Pork Shirt”? 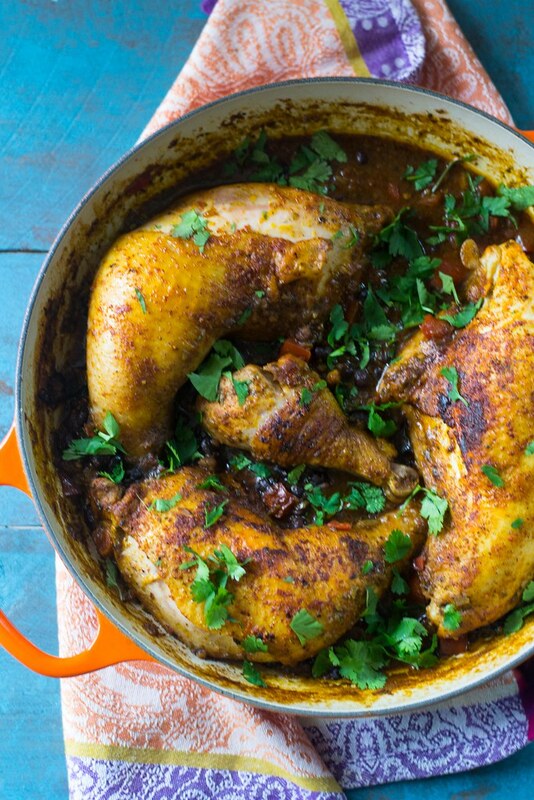 We’ll see…..
Now to the real reason we are all here….one pot chicken lovers, unite! 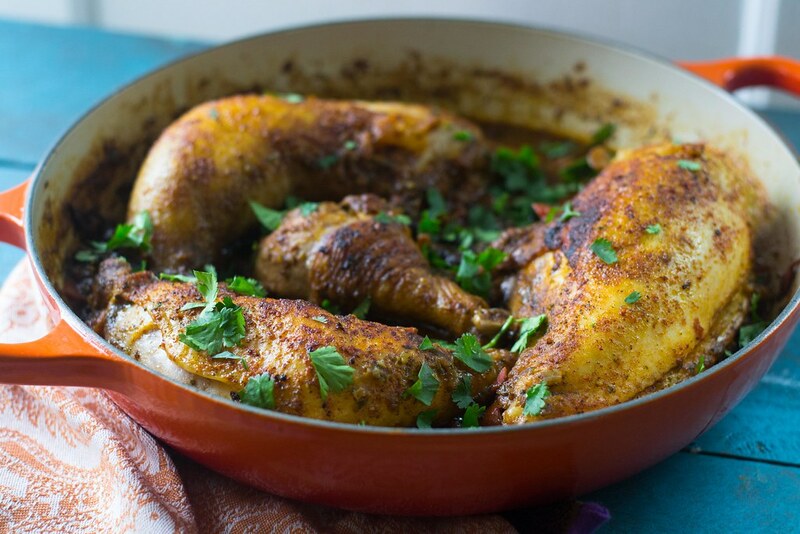 This one pot sazon chicken recipe has been on a constant rotation in the Ferraro house ever since I discovered sazon mix. You know that commercial ‘I put that sh** on everything”? I put this sazon seasoning on..everything! beans, chicken, soups, meats..it is amazing! And the color that the achiote gives off is glorious! Bright, golden yellow with red undertones…just beautiful. I am quite serious when I say this is a true one pot dinner, though I do serve it with rice on the side because it’s the perfect accessory for all that extra sauce you’ll want to mop up. First, the chicken is seared until golden with a helping dose of sazon seasoning and then everything else is added in, black beans, a few tablespoons of sofrito (which I keep in frozen cubes when needed for dishes like this), tomatoes and a bit of stock. Step away for 40 minutes and let all those Puerto Rican flavors simmer together. Garnish with a bit of fresh cilantro and trust me when I say this tastes even better the next day! 3 Tb sazon seasoning Recipe here! 3 Tb sofrito Recipe here! Firstly, grab your widest skillet and drizzle with a bit of olive oil. Not too much, since the chicken will give off it's own fat and begin to heat on medium-high heat. Then, season your chicken with sazon, salt and pepper on both sides until generously covered. Place chicken, skin side down in the hot skillet, It should automatically sizzle. Cook on first side for about 3-4 minutes until skin is golden brown then flip over and cook the other side for another 2 minutes until golden brown. Once ready, remove to a plate. In the same skillet, add chopped onion and cook for 3-5 minutes until translucent and add garlic and continue for another minute, stirring into the chicken fat and leftover seasoning in the pan. Pour in about 1/4 of chicken stock and deglaze the pan, scraping off any bits from the bottom. Allow to reduce for a minute or 2 on medium-high heat. Then stir in tomato paste, add chopped tomatoes, sofrito, can of black beans, the rest of the chicken stock and season everything with salt and pepper. Place chicken back in the pan, skin side up, making sure chicken is nestled in and skin still exposed. Cover and bring up to a boil, the reduce to a low simmer and cook chicken for about 40 minutes or until chicken is cooked through. Remove the lid for the last 10 minutes to sauce can reduce. When done, garnish with chopped cilantro and serve with rice if you'd like. Deglaze with a bit of stock to scrape off the bits on the bottom and stir in 1 Tb tomato paste. Then add chopped tomatoes, 3 Tb sofrito (or 3 cubes) and 1 can black beans, mostly drained, season with salt and pepper and stir around. Then add 1/2 cup chicken stock and the chicken back in, skin side up. Bring to a boil then reduce until cooked through. 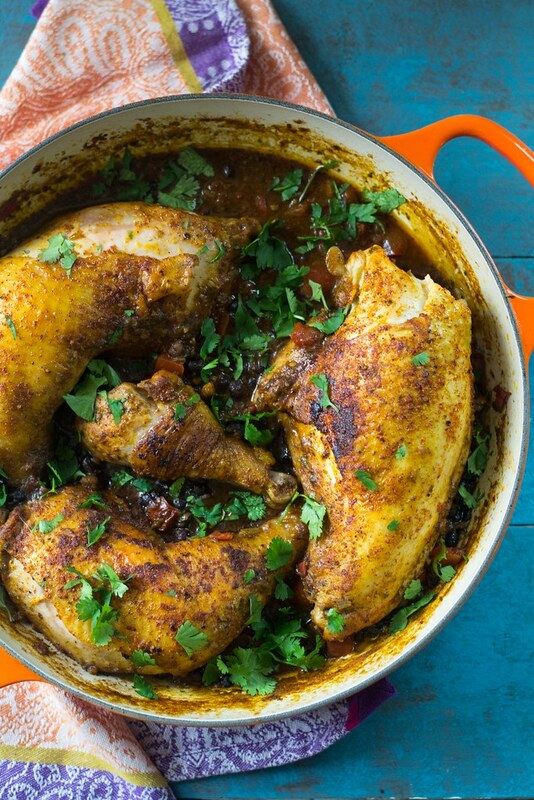 Here’s a few more one pot chicken recipes for dinner inspiration…. That is one glorious pot of chicken — I’m so excited to learn about sazon, I’ve never heard of it! Thanks Sue :)) I think you’d LOVE sazon!! I made a bunch and gave them out as gifts…it is easily one of my favorite spices!! Great recipe! Thanks for sharing! I going to try it by tomorrow.